The bodies of the Pinion Gear Box Gear Boxes are accurately machined, totally enclosed, oil tight, having a sufficient lubrication system and dust proof. 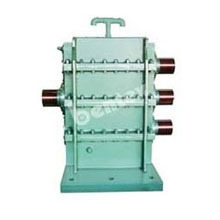 The gears of Pinion Gear Box are made of EN- Series Forged Steel for Gear Material as per customer's equirements. The Pinion Gear Box and Type of Gear Coupling are manufactured for 6" to 26" PCD as per Mill Requirement. Imported bearings are used and the oil seals are provided to protect the oil leakage.